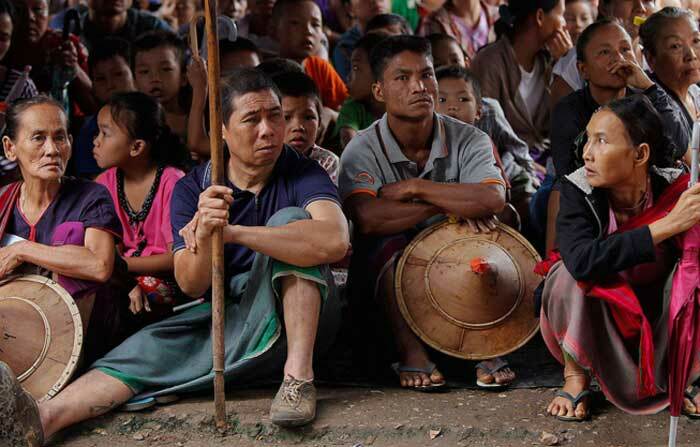 Mizoram on Wednesday began sending back the over 15,000 tribal refugees from Chin state of Myanmar. This was disclosed by Assam Rifles sources. They were taking refuse in four villages of Lawngtlai district of Mizoram. The refugees, mostly Christians and Buddhists fled their country and crossed Mizoram border last month following a clash between Myanmar Army Arakan army militants. The Myanmar Army had launched an all-out operation against the Arakan militants along Indo-Myanmar border in Chin state. The Arakan Army is a Rakhine insurgent group in Myanmar. It is the armed wing of the United League of Arakan (ULA), founded in April 2009. As a result of these clashes, these refugees numbering around 15,000 settled in bordering villages like Varang, Phaleiwa, Pakangwa, Stangwa and Mulao in Myanmar entered into Mizoram. Around 420 refugees have settled in Zochachhuah, 500 in Laitlang, 120 in Dumzautlang and 200 in Hmawngchhuah villages across the district of Lawngtlai in Mizoram. The Assam Rifles had immediately swung into action and intensified patrolling along the porous Indo-Myanmar border to prevent further influx. The Assam Rifles informed that apart from preventing any more influx of refugees, the personnel were also on their toes to check militants sneaking into Mizoram. The Assam Rifles are also extending humanitarian support to the refugees who have been taking shelter in community halls and school buildings, apart from guarding them. But now that the situation has improved with the Myanmar Army evicting all the camps of the insurgents from the region, the process of the returning of these refugees to their native country has begun. The Myanmar Army has also assured safe passage to these refugees going back to their native villages.